It was just a year or so ago we could not read the Tampa Bay Times or the now defunct Tampa Tribune about HART or PSTA setting new ridership records. Those days have been over for quite a while. Buried deep in the HART Board Packet for the June 5, 2017 meeting (PDF) is the April 2017 ridership summary on page 6-4. 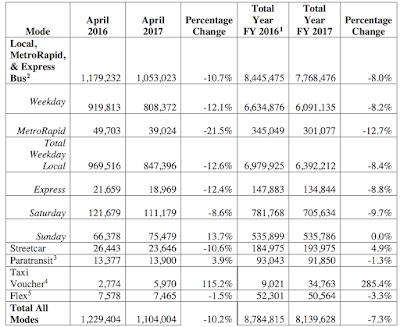 April 2017 bus ridership declined 10.7% compared to April 2016 and all mode ridership is off 7.3% for the first seven months of FY 2017. 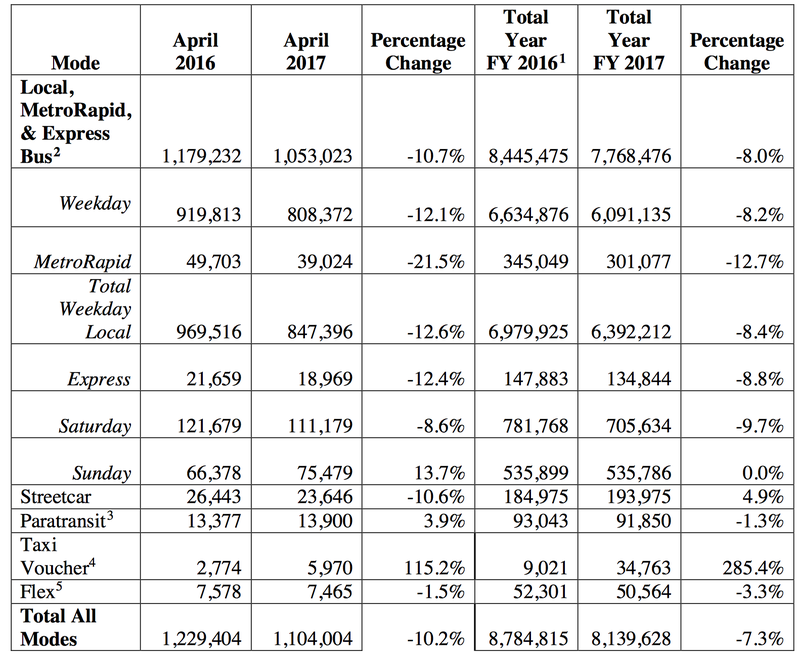 April 2017 streetcar ridership is down 10.6% compared to April 2016. Year-to-date streetcar ridership is up 4.9% compared to the same time period of FY 2016. Perhaps a few more riders are enjoying the trolley as the revitalization of downtown Tampa slowly progresses. Or perhaps because parking has been "gobbled up". Outside of New York, transit ridership is largely down nationwide the last couple of years. DC Metro in particular has taken some big hits as they've cut service in an attempt to catch up on a multi-billion dollar backlog of much needed maintenance. But many others that have invested billions in developing mass transit, particularly light rail and fixed guideways, are down in ridership as well. In a recent rare article lamenting decreased local transit ridership, it looks like HART is getting ready for a reboot. “If you see fewer people using your services across the board, at some point, you have to ask yourself, ‘what’s going on with your business model? And how can we reboot? '” asks Katherine Eagan, the CEO for HART. A few months ago, the Federal Highway Administration released 2016 vehicle miles of travel data, indicating robust travel demand growth in 2016, up 2.8%. The increase pushed total vehicle miles of travel (VMT) to a new record and boosted travel per capita to levels not seen since mid-2008. That disappointment was compounded by the recent release of 2016 transit ridership data, indicating a decline of 2.3% in 2016, which compounds last year's 1.3% decline. The disheartening news continued with the recent release of Census data indicating growth trends that had many highly urbanized counties loosing population while growth flourished in predominately suburban style counties. The top ten shrinking counties had a transit commute mode share over twice as high as the top ten growing counties. Piling on, other data indicates that millennials are morphing toward more traditional characteristics as "Millennials are starting to find jobs and relocating to the suburbs and smaller cities," according to a recent Bloomberg article. "Everything we thought about millennials not buying cars was wrong," says the title of a Business Insider news story. As the country goes, Hillsborough County and HART head in the same direction. HART of course will try to reboot, as stated above. We wish them the best of luck. The good news is that HART is solely a rubber-wheel bus oriented transit agency. It can make these changes as their transit market changes. Changes in their ridership, less demand, more demand, new destinations, can all be relatively easily changed without major capital investment. Especially compared to light rail and fixed guideways. 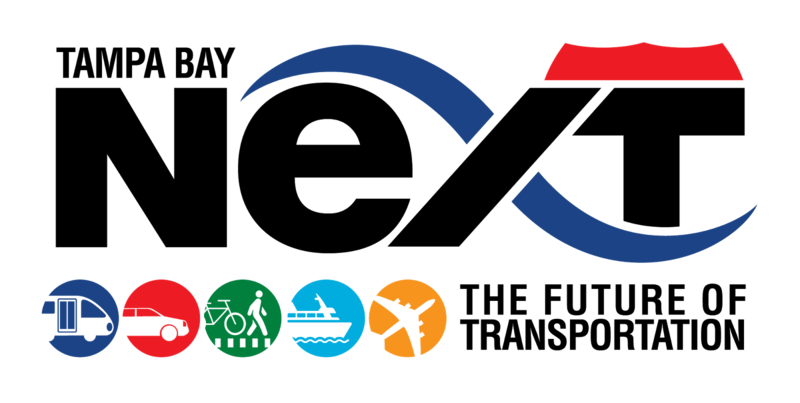 Regardless, as we take on the next phase of transportation issues in the region, with another reboot on the newly renamed Tampa Bay Next, it is increasingly important to understand the current state and trends of transit solutions, particularly here in Tampa Bay. At least FDOT acknowledges that math on the Tampa Bay Next site, as FDOT is forecasting nearly 300,000 vehicles per day on Tampa interstates by 2040, which will require further expansion of the Tampa Bay interstates. In their rather optimistic transit forecast, FDOT believes transit may take up to 10% of the cars of the road by 2040, or just under 30,000. That would require a triple of transit ridership by 2040, which few if any regions in the USA have done despite many investing billions of dollars into transit. Still, with the interstates approaching 270,000 daily vehicles, again with FDOTs optimistic transit estimates, up from 180,000 today, investment in the Tampa Bay interstates is critical to future mobility and economic development across Tampa Bay. Transit ridership is down locally and nationally. HART's contribution to commuters and therefore congestion relief is minor and will likely continue to stay that way. Choice riders have more money in their pocket and more choices. Not to mention the impact of future technologies on the horizon such as autonomous vehicles. More people are moving into Tampa Bay faster than transit can build out. They are moving into areas with sparse if any transit service - South Hillsborough and South Pasco - which will put further pressure on the already overload interstates. We have no realistic choice. Fix our roads - and our interstates - first!